Orchid Bee, common name for a group of brightly colored tropical bees. Orchid bees are also known as gold bees. There are more than 175 species. They occur only in the western hemisphere in tropical and subtropical regions from northern Mexico to Argentina. Many species of orchid bees collect nectar, pollen, and other substances from orchids. Orchid bees are among the most brilliantly colored insects. Many species are green, blue, purple, gold, or red. Some are black with yellow or white hairs and resemble bumble bees, to which they are closely related. Orchid bees range from 8 to 30 mm (0.3 to 1.2 in) long. They have tongues that, in some species, may be twice as long as the body. The long tongue allows them to reach nectar in deep-throated tropical flowers. Orchid bees are fast, strong fliers and can travel great distances. Some are known to fly as far as 45 to 50 km (28 to 31 mi) in search of flowers. Orchid bees drink nectar for energy. Male orchid bees are especially attracted to orchids, from which they collect fragrant oils that are stored in specialized receptacles on the hind legs. The orchids often produce no nectar or pollen, but they have special mechanisms that attach the pollinium, or pollen bundle, to a specific location on the bee as it gathers oils or searches for nectar. The pollinium releases its pollen on the next flower of the same species that the bee visits. Males of some species are easy to observe because they can be attracted to artificial fragrances. Females are less attracted and thus less frequently seen. Orchid bees display very interesting foraging behaviors and are believed to be important pollinators of many tropical plants. Plants in the tropics do not grow in groups, and individual plants of the same species are often miles apart. Orchid bees are believed to forage on specific plants along set routes, a behavior known as traplining. The nests of only a few orchid bee species have been found. Nests are constructed in cavities in wood, in fern roots, in the ground, in bamboo stems, in termite nests, under palm leaves, in crevices, under bridges on rocks, and on roofs of houses. Nests are lined with resin collected by the female. Some species seal up the nest entrance with resin at night. Some nests are constructed of wood chips or bark mixed with resin. Many species nest in groups. Some nests are shared by a number of individuals, but each female constructs her own brood cells (compartments for the young) independently. Nests may be used continuously by different generations of orchid bees. Orchid bees in one genus have lost the ability to make their own nests. Instead, they parasitize the nests of other orchid bees. 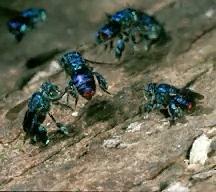 Other types of insects also parasitize the nests of orchid bees. These insects include velvet ants, blister beetles, and other types of parasitic bees. Scientific classification: The orchid bees comprise the tribe Euglossini in the family Apidae, which includes honey bees and bumble bees. The largest orchid bee genus is Euglossa. Bumble bee-like species belong to the genus Eulaema. Parasitic orchid bees are in the genus Exaraete.